Brand marketers invest billions to create an emotional connection between their brand and prospective customers. As media fragments and customers increasingly engage with the brand in ways outside the direct control of the corporate marketer, brand positioning and messaging and the building of emotional connections with consumers becomes more challenging. When a distributed marketing network - an organization whose success depends on franchise networks, VARs, dealers, agents or chain store marketers to carry the national brand message to the local level - is involved, even more challenges arise. But alongside those challenges is a large opportunity. Unlike the marketer who has little or no help with brand messaging at the point of customer engagement, the marketer with a distributed network has an army of brand warriors ready, willing and able to help deliver and manage marketing messages. 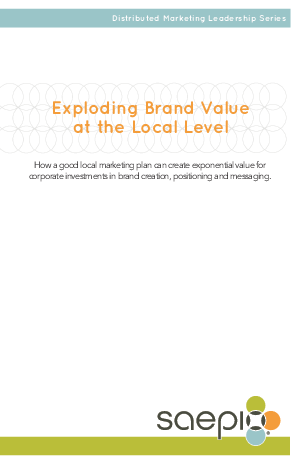 When trained, organized and mobilized, this army of local marketers can explode brand value at the local level, creating exponential value for the corporate investments in brand creation, positioning and messaging.